Hulamin is an independent mid-stream aluminium semi fabricator and fabricator of aluminium products. It is a primary metal beneficiary. Hulamin is focused on South African and other product-specific end-use markets around the world, and creates value through meeting customers' needs for high-value aluminium semi-fabricated products. In doing so, it brings economic activity to the province of KwaZulu-Natal, stimulating business activities, creating employment and contributing to the upliftment of this region. Although it is the only major aluminium rolling operation in sub-Saharan Africa, Hulamin exports more than 60% of its sales to customers around the globe. The company is committed to contributing to the upliftment of manufacturing in South Africa through its role as both supplier and customer; and to its role as a responsible leader in sustainable development in southern Africa. Each of its businesses shares a passion for aluminium, a unique metal with a superior range of benefits and endless application possibilities. Hulamin has grown and expanded operations with significant investments over the last twenty years to ensure the future of the company and aluminium. As South Africa underwent the transition to a democracy and the world markets opened up in the 1990s, a period of rapid change ensued for Hulamin. The company chose to seek opportunity in its future by committing the organisation to an unprecedented transformation, expanding its rolled products manufacturing facility. The R2.4 billion expansion project in 1996 improved manufacturing processes and invested heavily in production, facilities and equipment. The ambitious expansion unleashed enormous potential at the company and by the year 2000, turnover had doubled. In 2006, Hulamin expanded its rolled products capacity with a R940 million investment. The expansion addressed two requirements: A need to increase production capacity, and improving the company's ability to deliver higher value products. This expansion increased Hulamin's rolled products capacity by 25%, increasing its competitiveness, especially in the foil and plate product markets. The more recent upgrade of the recycling plant followed a game changing agreement between Hulamin and Nampak Bevcan in 2013. The R300 million state-of-the-art facility was built specifically to recycle used aluminium beverage cans. The expansion sees Hulamin providing aluminium to Bevcan for the manufacture of all-aluminium beverage cans to the local market. Many kinds of beverage cans, including well-known brands like Coke, Fanta, Castle and Hansa are converting from tin-plated steel to aluminium. The furnace installed is touted as the world's most energy efficient and environmentally friendly way to melt contaminated aluminium scrap. While most other furnaces incinerate reclaimed cans, the new Hulamin furnace remelts the thin aluminium of used beverage cans while conserving the maximum amount of aluminium from the scrap. The volatile organic compounds present in coated beverage cans is consumed as fuel to power the furnace, resulting in less landfill and fewer emissions into the atmosphere. 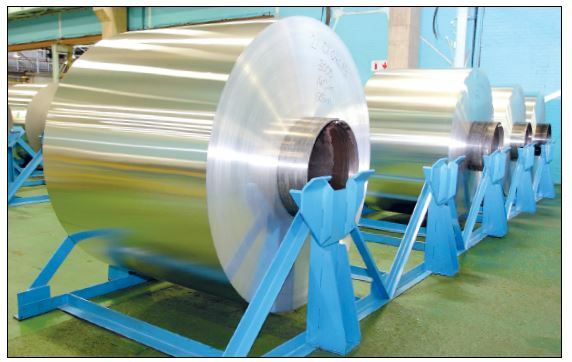 In 2015 Hulamin ensured its future as a leading player in the aluminium industry when it became a strategic partner with a BEE entity, Isizinda Aluminium. Together a transaction to acquire the Bayside casthouse in Richards Bay was completed. The shareholders of Isizinda Aluminium include Bingelela Capital and Hulamin with 60% and 40% ownership respectively. Isizinda Aluminium is a KZN broad based black economic empowered consortium. Bingelela Capital which is Zululand based comprises four different groups, and is 100% African owned with a 52% female shareholding. The transaction culminated from several years of positive engagement between Hulamin and BHP Billiton to ensure the sustainability of the Bayside casthouse. The transaction includes a liquid metal supply agreement, whereby liquid metal from the nearby Hillside smelter is transported to Bayside. Hulamin operates three businesses: Hulamin Rolled Products, Hulamin Extrusions and Hulamin Containers. The processes and manufacturing operations critical for Hulamin's businesses are located in Pietermaritzburg, KwaZulu-Natal and Midrand Gauteng. complex nature of rolled products makes it a popular choice in South Africa, regional African markets and across all continents. Hulamin Extrusions has the widest range of extrusion capabilities in sub-Saharan Africa. It has a leading position in the demanding engineering markets, in transportation, renewable energy, automotive and general engineering applications and is also a supplier of architectural extrusions. Hulamin Containers is South Africa's leading producer of rigid aluminium foil containers and related branded culinary items, such as foil and confectionery dishes, for the catering and food industry. Hulamin is committed to a future with aluminium. chosen market sectors, with an emphasis on our local and regional customers.